Hi all. I have a question about border less printing. I design and create large tiled posters. I take an image and Slice it up into 8x11 pieces, print each piece and then assemble the pieces to make a poster. I am having an issue such that when I print my slices, what's coming out of the printer does not match what's on my screen. The result I'm getting is that the edges are cut off about 1/16 of an inch. This doesn't seem like much but in the poster world, if all the pieces don't line up perfectly, it's not good. I've done some research and found out that printers automatically scale the image when using border less printing so that it makes sure to print the whole page with no white border. So essentially the image is larger than the one on the screen. I've tried tweaking things in advanced printer setting but with no luck. The images I'm trying to print are of a basketball game and in the background is tons of detail in the form of faces in the crowd. So it's extremely obvious when the pages don't line up. If anyone can offer some advice or help, I would greatly appreciate it. Also, if someone has a simple way of slicing the photo into sections, I'd love that advice as well. Currently, I'm making a grid, selecting, copying, pasting into a new document, and printing. I wish there was a way to just make a grid, and then print each section but I have yet to figure that out. Thanks! as for your printer issues I cannot offer much. To slice your image, you could create a set of guides (which you can save and re-load as required) with this GAT plugin. 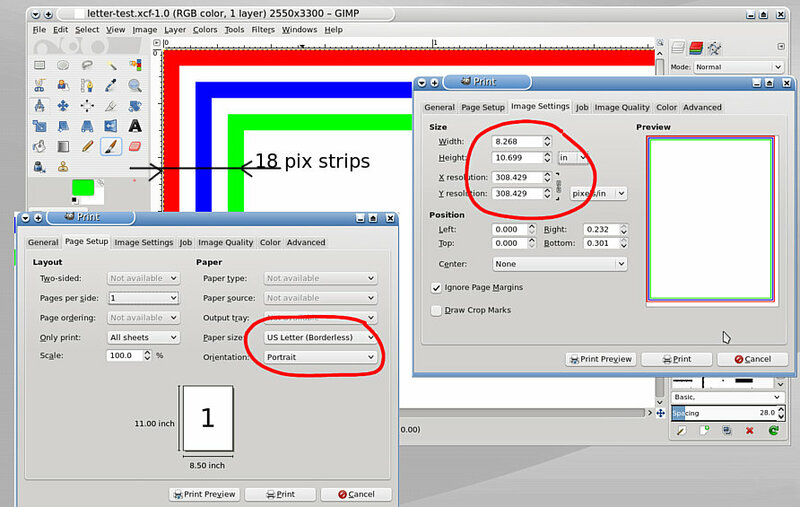 Then use Gimp's Image->Transform->Guillotine function which will create a separate image based on position on those guides. Thanks, Fluffybunny2! I actually just started toying around with the guillotine function the other night. So in order to set a guide used for slicing, I would have to download that plugin?Is there any way to just lay a grid and then use the guillotine function? That would seem like the easiest way...thanks a lot! Quote: I would have to download that plugin? Don't you just hate those clever links. http://registry.gimp.org/node/25332 this is a python plugin and goes in your plugins folder. Looking at your original post about printing and losing margins, I wonder if there is something a bit more fundamental. Are the segments that you cut up in proportion to the size of the paper you print on? Say US letter which is 8.5" x 11" so the segments really need to be in that proportion. That is lots of useful information. As for the specifications, I am printing on 8.5x11 photo paper and I make sure that is the exact size of each of my sections. Also, I make sure that the printer is set to these dimensions as well. This would be an easy fix if the image was just being slid over 1/16 inch, but the image is actually stretching to cover more surface area, so the discrepancies are off on all sides of the page. I have been reading some photoshop forums and some artists are having the same problem as well. If there is anyone out there who is experienced in borderless printing or tiled poster making, I would appreciate the help. Thanks a lot! There was certainly a bug that affected printing on A4 paper using Gimp and the A4 template, might be the same for US letter, but equally as probable, is your printer driver. Printing in Gimp (windows that is, linux is a bit better) is not very good. Maybe try some other application such as XnViewMP. Might prove if Gimp is the problem. In the meantime, 8 tiles x 11 tiles is a lot of images to save one-by-one, so a couple of useful scripts. I do have a small stock of 'US letter' left over from several years ago, and I could get a result. Using Gimp US letter standard template, 300 ppi, 2550 x 3300 pix, made some calibration borders, 18 pix, as close to .0625" as I could manage. 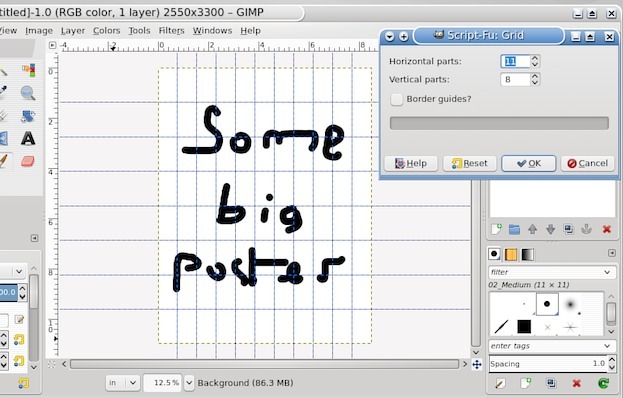 Using the standard gimp print. Set up US letter borderless and printed off. It printed smaller than required so back to the print setup and I found Gimp had set a X,Y resolution greater than 300 ppi. Why I do not know. Setting to 300, got the size back to 8.5" x 11" and this time it printed ok.
http://i.imgur.com/rfeCjCK.jpg as good as can be expected from a printer with a poor paper feed. IMHO, first check those settings, if the 1/16" is still lost have a close look at the printer driver settings. For example is there a setting for 'bleed area' a margin usually 1/8"
Lots of good info, again. Probably should have mentioned that I'm running a mac...I'm hoping that this isn't a PC only forum...if it is, I apologize. I'm running OS X 10.8.4, on a MacBook Pro (not the most ideal of machines for poster making but it's what I have right now), and printing with a brand new Canon Pixma Pro-100. "Expansion: If you print a photo at 4x6 inches on 4x6 paper, for overspray to be able to account for slack in paper loading, there obviously must be some expansion (enlargement) of the image. In reality, your 4x6 photo has to be expanded to something like 4.2 x 6.2 inches so that about .1 inch of the photo prints off the edge of the paper. This is where most of the confusion begins with borderless printing. Due to the fact that your print driver expanded your 4x6 print and is printing part of the photo off the edge of the paper, there will be some cropping of the image at the edges. Some print drivers allow you to adjust the "amount of extension" but be aware that most drivers will not allow you to turn expansion (AKA extension) off completely because doing so usually results in small slivers of white on one or more edges." "Many Canon print drivers offer a selection called "amount of extension". If you slide the "amount of extension" slider all the way to the left, you can actually disable the driver expansion but be aware that doing so may cause small slivers of white border to appear on your paper because the paper cannot align exactly every time. Most other non-Canon drivers do not allow you to completely disable the print size expansion but some allow you to select less/more overspray which equates to less/more expansion." I tried messing with each of them, but nothing ever came out correctly. Sometimes there was a white strip and sometimes the image was even further off than before. I will try to tinker with the information you provided but thinking I may just be out of luck here. Thanks again!